Yeah, life is a carnival cruise, that is. 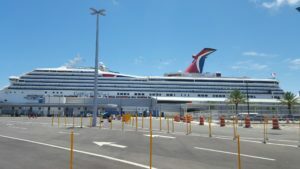 While the world was at work last Thursday, I was heading down to Port Canaveral towards a boatload of fun. 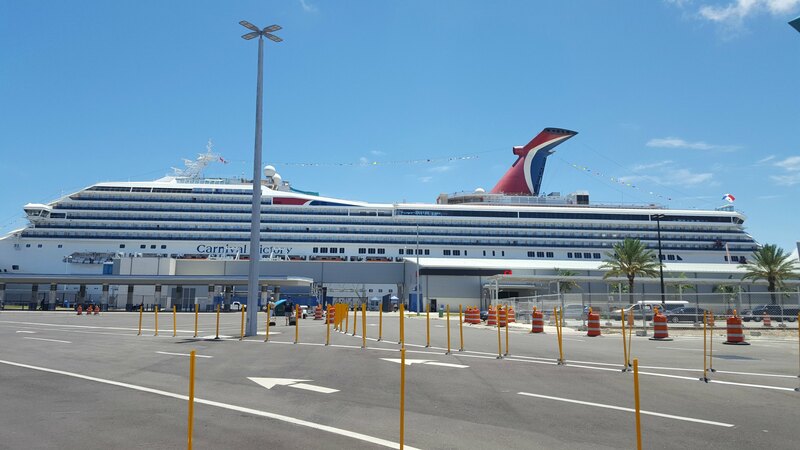 Here, I boarded the Carnival Victory which was headed to the Bahamas, for a quick vacation and to celebrate my friend’s birthday. This was my first time cruising so I was excited of course. I also thought this was the perfect way to end my summer as I prepare to begin school in the Fall. The drive to Port Canaveral was around two hours, which is good considering how I like to ‘push the whip’. 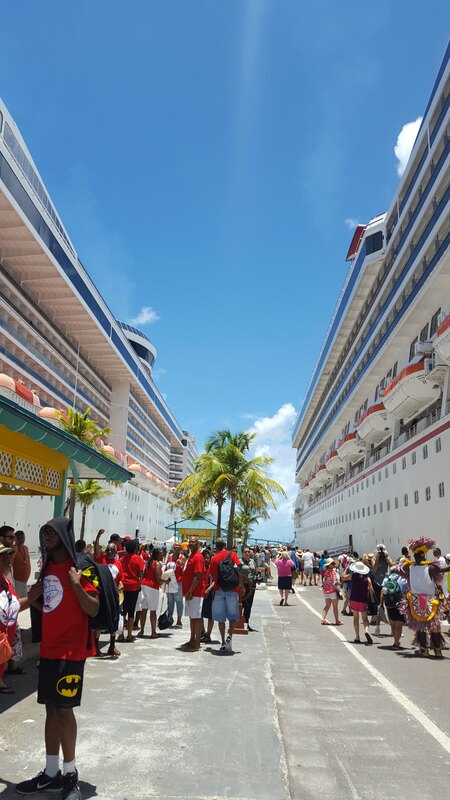 Navigating the port and checking in was seamless considering there were 3000 other passengers joining us on the cruise. The easy process got our weekend shenanigans off to a great start. We booked an Oceanview cabin on the Riviera deck, which turned out to be a great way for me to view the ocean waves and land as we left the port. On the first night of the cruise we enjoyed a full course meal in the Pacific Dining Room before heading to the casino. We all won some money (a few dollars) on the slots which is all we knew how to play. Later we changed into out swim suits , grabbed a glass of wine and ended the night in the swimming pool and hot tub on the top deck. The real fun began the following day when we arrived in Nassau where we decided to wait until we got onto the island to book our excursions. We collectively decided to first do a private island tour of the island with a local cab driver. 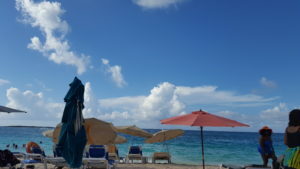 We then briefly stopped at world famous Atlantis Paradise Island Resort at the recommendation of a lovely retired couple we met during lunch on the ship. We didn’t shell out any money for Atlantis day passes. Our taxi driver who dropped us off at resort just told us to walk in there and act like you know where you’re going and what you’re doing to avoid any security mishaps. That’s exactly what we did too (lol) as we were able to view as much of the property as we could. Once we left Atlantis,, we headed down to Cable Beach which was within walking distance from the resort. 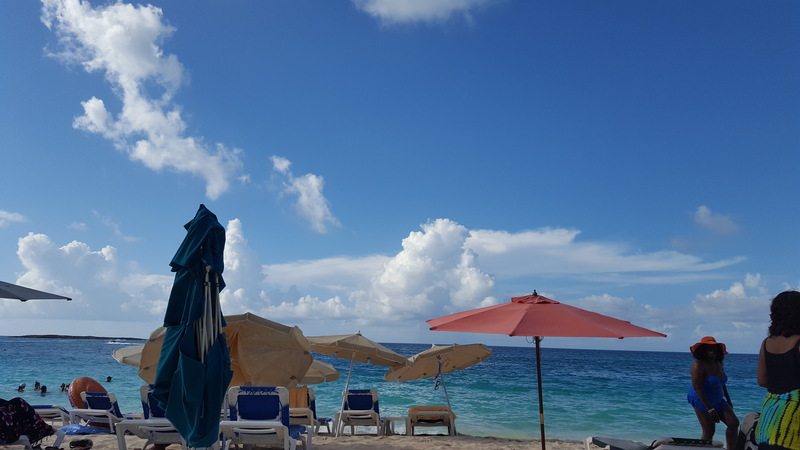 At Cable beach you relax by the water, swim or engage in some water sport activities such as parasailing, banana boats, or jet skiing. We settled on the jet skis to my delight and I was able to rent one of my own. I had never rode one before so it took a minute for me to get used to it, but once I did; it was a wrap! I looked like a pro by the time I was done. Even though I’m not the world’s best swimmer and I was scared a first, being in the ocean on that jet ski by myself was pure bliss. Hitting the waves at high speeds and feeling the salt water spraying in my face was exhilarating and a moment I will never forget. This was my first time traveling outside of the U.S. and this trip was a great way to get my feet wet. 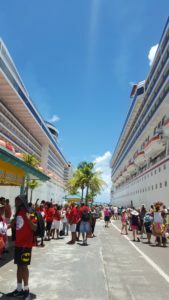 My favorite part of the cruise was arriving at the port of call in Nassau.The island may be small but I had a great time interacting with the locals, admiring the historical sites and getting out into the open water doing things I’ve never done before. This was definitely a trip to remember and I can’t wait for my next excursion.